Your friend Steve gives you the key to his drink’s cupboard and tells you that if he asks for the key in the next few days you are not to give it to him. A few days later he asks for the key and you remind him what he originally said to you. He replies that he has now changed his mind and wants you to return the key. Do you return it to him or not? This thought experiment is designed to help identify your assumptions about human nature. Do you think we have an unchanging essence or core personality, or do you believe that we are defined by our choices and that we are always re-creating ourselves based on them. If you believe the ‘real’ Steve spoke to you a few days ago then you will honor his wishes and refuse to return the key to the current Steve who you clearly judge to be less ‘real’ than the Steve of a few days ago. If, on the other hand, you respect the fact that Steve has genuinely changed his mind (re-created himself) you will feel obliged to respect his wishes and return the key. Jesus said: “He that findeth his life shall lose it; and he that loseth his life for my sake shall find it.” What did he mean by this statement? He is not saying that if you lose yourself you will find your old ‘self’ again, he is saying that if you lose yourself you will find a completely new more improved ‘self’. This interpretation helps explain the first half of the quote. If you just find your old ‘self’ again you are finding something of less value than you are likely to find after you have lost yourself and re-created yourself anew. This view, that we define ourselves by our choices, runs counter to the mantra of the baby boomers, still dispensed ad nauseam to students and adults alike, that we should follow our passions and our dreams, and above all, that we should find ourselves. How many of us, particularly when we were young and starting out in life, had any idea who we were and what our passions and dreams were? Reflect back on your own life and ask yourself whether your dreams and passions didn’t emerge in the process of going through life grappling with issues and problems that you came across without any intention or design on your part. A good teacher kindled a spark of interest in biology, a summer job abroad led to an interest in travel, a poor computer game led you to write a better one, an extravagant spouse led you to take work more seriously and start your own business. But for these contingent events your life would have been very different. We don’t form a ‘self’ and then choose to lead a life that fulfills our ‘self’ rather we stumble into life and form our ‘self’ in the process of solving life’s problems. 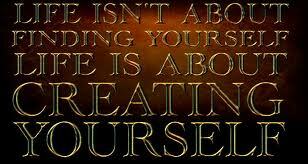 The purpose of life is not to find ourselves but to lose ourselves and in so doing create a ‘self’. Skimming through shorter posts, I wasn’t going to read this yet, at this late hour….. but I did (changed my mind) and am better off for it. My change of mind led to an improved outlook with which to fall asleep. We indeed do have the privilege to change our minds, to pursue something we did not choose to do earlier. Enjoyed this (as all your writings!) and how true. Nice second to last line, and not only to we form ourselves in the solving of problems but in just living out the necessities of daily life as well. Agreed and often there is just as much drama in the everyday activities of life. Thank you Ishaiya. That’s a wonderful and unusual perspective. It is knock-out stuff (to quote Bernard Black from “Black Books”). What am I to say? In the first example, I would not give him the key to the liquor cabinet, but that has little to do with someone changing their mind. I do agree, however, that one is very much defined by the choices one makes, and the resulting experiences, which pretty much happens by chance. I concur with your intention to withhold the key. You promised to protect him from a change of mind. Relinquishing the key to him on the grounds he “changed his mind” is precisely contrary to your agreement with him and betrays his trust in you. On your second point, I disagree “one is defined by the choices one makes.” Humans are ongoing processes. We’re continually in flux. No one choice or even pattern of choices defines our total being. Suppose at age 50 I learn Russian, whereas I previously spoke English only. If I had allowed monolingualism to define my essence, my being, or my personhood, I would have conceptually blocked additional options. Better to have defined myself as a human being who speaks one language currently, yet has the potential to learn more. My book, _Three Minute Therapy_, Chapter 3, “Self-Esteem: The `Feel Good About Yourself’ Trap” elaborates on this perspective. I realize it is extremely complex, so you must also realize that I will not go into my entire model of personality development in a comment. Michael, I don’t see why your promise to protect your friend is more privileged than your respect for him as an individual who is capable of changing his mind. Secondly your claim to disagree with the statement that “one is defined by the choices one makes.” cannot be strictly true. At the least you would have to agree that one’s life can be defined by the sum of all the choices one makes in life. What else could have a better claim? Certainly not the simple statement that we are all human beings which really doesn’t say much as it begs the question of what kind of nature human beings have, a question we are trying to answer. NicoLite, thank you for introducing me to the ‘Black Book’ series which I was not aware of. I think I’m going to enjoy watching it. A contract or agreement is useful precisely because both parties agree a later change of mind does not invalidate the initial agreement (unless specifically permitted by the contract). What good is a real estate sale agreement, for example, if after paying you the agreed amount the first year, after the second year I can change my mind and decide I’ve paid you enough, the house is now mine free and clear? Second, there are an infinite variety of aspects attributable to an individual beyond their choices, including their height, weight, eye color, unrealized potential, interests, skills, musical talents, intelligences, tastes, genetic predispositions, illnesses experienced and vulnerable to, etc. Promises and contracts are broken all the time because circumstances change. If I genuinely believed that my friend had changed his mind about our agreement then I would feel no compunction about returning his key. Indeed, I would be violating his trust in me as a friend if I did not. Second, we usually define things by what is unique or different about the class of things they belong to. For example, a chair is defined as something we sit on which usually has four legs and a back. Of course you could define it by another less relevant criteria, such as the number of nails used in its construction, but then the definition would be less useful. Defining humans by their choices makes perfect sense, particularly in the context of a discussion about human nature. Defining humans by their height does not. Hi Malcolm, This may be one of the most thought provoking blogs I have read. So, what about the person who stumbled down the road of life doing what he guessed would be his passion for life only to find his ladder leaning against the wrong wall at age 40 or 50. You can always move the ladder but sometimes you can’t move it far enough or it is just too short and that provides the element of tragedy in life. At 20 you still had the possibility of becoming an astronaut but at 50 you no longer do. Malcolm, May I share this post on my blog at ClayMize.com? Of course. Thank you for reblogging. I really love this post, Malcolm. We are our choices because our choices lead to our experiences. Our experiences shape us. Thank goodness we have a lifetime of experiences to shape us into something of worth. If I had died at twenty I would have really missed the mark. That’s a great way of putting it. I think if we all applied this statement to our own lives we would come to a similar conclusion. With your latest caveat, we may agree on this one. If you believe, due to changed significant circumstances, Steve is not using this as another of many excuses to fuel his alcohol addiction, then returning the key would be fine. In my clinical psychology practice with addictions, this reversal of Steve’s is usually a red flag, a rationalization to continue an addictive behavior. In addition, I help deeply depressed individuals who have defined themselves by the poor life choices they’ve made. They define themselves as Total Failures, because they’ve failed at relationships and careers. This self-definition leads to acting incompetently, behaving irresponsibly, and sometimes thoughts of suicide. When I teach them to unconditionally accept themselves as the imperfect humans they are, who have failed in the past yet have the potential to succeed in the future, they do and feel significantly better. I love this! Fits well with my own current pulling apart, and re-examining of my own life, person and being. I find myself agreeing with all of it though, so perhaps I am still confused!! Thank you for your kind words, Savvy Senorita. You can read more about this philosophy, called Rational Emotive Behavior Therapy (REBT), on my site http://www.ThreeMinuteTherapy.com. You’ll find my article and book chapter on self-esteem, both of which may be of particular interest to you. Thanks for the recommendation, appreciate it! Well, I’m not sure there is much difference in our views here. It seems you could just as well teach your patients that they made some bad choices in the past but now have the opportunity to make some better choices in the future. Doesn’t being an “imperfect human” mean exactly that, i.e. that we make both good and bad choice? Consequently, if we are defined by our choices we are definitely “imperfect” creatures. If all you meant by “defining humans by their choices” involved concluding we are imperfect creatures, then certainly there is not much difference in our views. It’s my impression you meant defining individuals in terms of specific choices, not merely their imperfectability. Well, if all my life I’ve chosen to hurt people then, until now, that’s the person I’ve chosen to be, a person who hurts people. However, choice involves the ability to choose differently, so I am not inherently a bad person, just a person who has chosen to act badly. So, yes, I am defining people by their specific choices. I think this echoes the sentiments of Robert Frost in The Road not Taken. One of my favourites. Jon, thank you so much for this. I wish I would have thought to have used the poem in the post because it certainly does capture its essence. What came to mind, post-post reading was a remark often attributed to Keynes, in which he is said to have said, “When my information changes, I change my mind. What do you do?” Perhaps the matter is as simple as Steve having changed his mind, which would have been his right. An ever-evolving self is going to be viewed/assessed/considered in different light by an educator, a counselor, a coach, a mentor, a physician, etc. And each may have a unique interpretation of Steve’s situation and thus, answer to your intriguing question. Having read some of my posts, you may be aware of my advocacy for choice and the freedom it can yield. Simply put, Steve made a choice. His choice. Eric, thank you for this very astute observation. Each of these people will indeed have a different perspective on personhood and so maybe human nature is what philosophers call an “essentially contested concept”, something that we continue to argue about but never unanimously agree on. So interesting Malcolm! My view (based on studying a lot of Buddhists texts, which ring true to me) is that the ‘self’ as a separate and solid identity doesn’t exist anyway, and that by holding onto it, we are being unrealistic, and thereby creating a lot of problems for ourself (and others!) So getting rid of this false sense of an inherently existing self is one of the main aims of Buddhist teachings. However, the self as an interdependent construct, which is constantly changing, can’t be denied. That exists, as long as we keep creating it; as T. S. Eliot wrote, “You are the music, as long as the music plays.” This more realistic view of self leaves us open to transformation, which I think is what you are suggesting? Exactly so. I didn’t know I was a Buddhist! Well, Malcolm, this is so deep and at the same time it seems so simple…Thank you to let us think one more time and to go down to the deepest parts of my brain. Simone, thank you. I consider it a great compliment that it made you think about these issues. I really like your opening, how you spiral down from the simple to the deep. But Jesus never spoke of a makeover. Contrary to popular perception (or interpretation), the Bible does not ever speak of our becoming new and improved. Instead – of nothing short of a rebirth (hence the “born again” Christian, now tragically a hackneyed phrase). Can a leopard change its spots? Jeremiah 13.23 asks. No. We can do nothing to help ourself. Hence the need for the Cross. Once a believer rests on that, HE starts transforming us, inside out. Diana, I apologize, but your comment from a week ago has spent the time in my WordPress spam prison, clearly a case of mistaken identity. Thank you for taking the time to educate me on this. The responsibility for my interpretation resides solely with myself and I make no claim to any special expertise in biblical exegesis. However,I used this widely known biblical quotation more to make my point less abstract and less to obtain biblical support for my position. Thanks for the update, MG – and the ongoing support. Awesome post! It resonates well with some of my own thoughts about self, which I think you copied the opening on. I finally have some time to catch up on you blog, and I’ve enjoyed it a lot. Cheers. Brett. Thank you. Your post made me want to set down my own thoughts on this subject. Another great post, could not agree more. The more lost we become, in essence the greater opportunity we have find what it is we should become… Not sure if we will ever find out, but it is the path we take that is important. Thank you. This is exactly right. I suppose it could be construed as an argument for maximizing one’s experiences so as to maximize one’s opportunities. “Humility is a virtue, not a neurosis.” ~ Thomas Merton. Thank you for this quotation and part of being humble is being open to learning from everyone and everything. Thanks for making me smile. I’m all about the new and improved.